This past week has seen disturbing activity with the ISIS finding success in Iraq, forcing some 500,000 refugees to flee their homes. 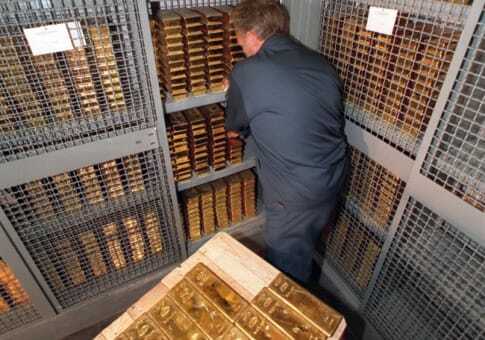 Of those who have fled, those who own gold will at least have a portion of their wealth with them that will aid them in their tribulation of the future. In Eastern Ukraine, in the insurgent-dominated Donbass region, citizens are fearful of a catastrophic response by the Ukrainian army especially after the recent downing of a transport plane. People may choose to find refuge in Russia, and for those with gold, they will have something that they can trade in order to re-establish themselves when they find a landing spot. Here in the United States, we too are not exempt from catastrophic events. With the rhetoric and ideologies of current political extremist groups, Williams argues that another terrorist attack would not be farfetched. Meanwhile, inflation has seen a gradual rise in recent years, and there is no reason to dismiss another stock market crash in the coming years. It is indeed a perilous world, and holding gold as a protector of wealth may be as important now as it ever has been – not only as a way to make money, but as a shield against losses should banks collapse and markets crash. Williams suggests that it is a prudent move to hedge one’s assets against external forces that may be at the verge of bringing down the current financial system. One of the key recommendations for the new benchmark is the use of “observable transactions” in order to preserve the integrity of the industry. Dempster also comments, “Our objective in convening this forum is to ensure that the full range of analysis and market perspectives from all parts of the gold supply chain are debated, understood and brought to bear on any potential changes.” The mechanism should be based on executed trades rather than submitted quotas. The integral component to the reformed benchmark is transparency. After meeting last Wednesday, the Federal Reserve revealed that interest rates will remain low, meaning that the value of the dollar will likely be further depressed and the demand for precious metals as an alternative investment will be magnified. In reaction to the meeting, gold surged the most in nine months and silver jumped to a 13-week high. After weeks of docile trading which saw the metals 60-day historical volatility to the lowest since 2010, prices are now jumping. With the European Central Bank pursuing steps to boost economic growth and Fed Chair Janet Yellen’s low interest rate outlook as well as the worsening situation in Iraq, investor interest in precious metals is revitalizing. Scott Gardner, a manager at Verdmont Capital SA touched upon the market activity, “People perceived what Yellen said yesterday as less hawkish, and that’s bringing in money to the gold market. The dollar is moving lower, and gold is gaining because of that.” Gold has climbed 9.3% this year, partially on concern that economic growth was stalling and among the violence in Iraq as well as escalating tension between Russia and Ukraine.